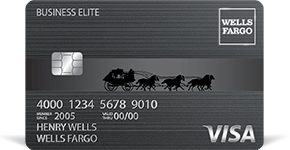 Wells Fargo Business Elite Card is a credit card that allows small business owners who spend more than $10,000 monthly earn bonus points or cash back. It also offers a grace period of up to 25 days on purchases. We compiled Wells Fargo Business Elite Card user reviews from around the web and determined that they generally have a mix of positive and negative ratings. We also discussed the rates and fees it offers. People who left a positive review of Wells Fargo Business Elite Card said that the card allowed them to get a great rewards points program. Users also found the option to set specific spending controls depending on each expense category to be very helpful for their business. People who left a negative review of Wells Fargo Business Elite Card said that the card wasn’t very versatile in giving travel rewards if the user already has a preferred airline or hotel. Some users were not satisfied with the ideal spending bracket per billing statement that some of their businesses did not reach so they were not able to maximize the rewards points program. A user who gave Wells Fargo Business Elite Card a positive review on Fundera said that the expense management feature was a very practical tool in monitoring spending, especially during business hours. One user who gave Wells Fargo Business Elite Card a negative review on Fundera expressed dissatisfaction with the very large spending range that needs to be met in order to get good rewards from the rewards points program. Get a $1,000 cash back bonus when you spend $25,000 in the first three months. There are no required spending categories or caps. You have an option to choose between Cash Back or Rewards Points. One dollar in net purchases earns 1.5% cash back. You can receive cash back automatically as credit to your statement or to your eligible checking or savings account each quarter. Receive 5,000 bonus points when your company spend reaches $10,000 in any monthly billing period. You can get 10% bonus when you redeem your rewards points online. Rewards points expire at the end of three years.